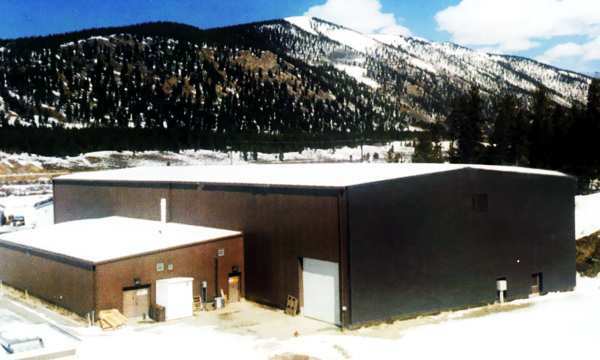 At the Water Treatment Plant in Leadville, Colorado, contaminated water from the Leadville Mine is treated. The cold harsh climate, along with the high ventilation requirements within the building created two different sets of problems for plant managers. Firstly, the existence of noxious fumes from the chemicals that are used to treat the contaminated water means that a continuous supply of heated ventilation air is needed in the building to maintain a high level of indoor air quality. Secondly, at a latitude of 3000 meters, another concern was the tremendous expense of heating the building in such a cold climate. The situation was compounded by the fact that water from the Leadville Mine flows continuously through the building, drawing heat from the air. The problems were so severe that outdoor clothing had to be worn inside, despite having the heaters on at all times. The solution to both problems was resolved with the installation of a SolarWall air heating system. Measuring 1755 ft2 (163 m2 ), the bronze solar cladding harnesses the heat of the sun, and uses it to warm the ventilation air which is drawn into the building through the perforations in the solar panels.